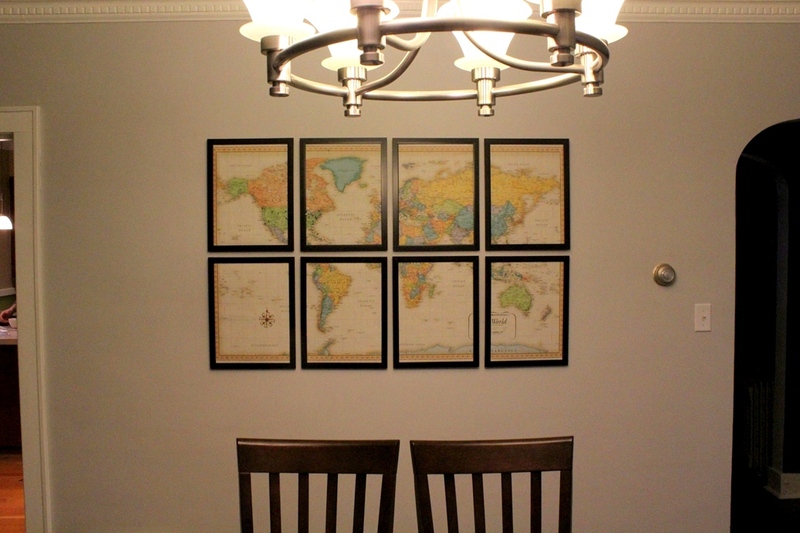 So very excited to show you our DIY Map Art finally on the wall! It’s been nearly two months (embarrassing much?) since I put this art together for the Pinterest Challenge but first we had to wait to hang it until the room was repainted. And then, since we chose an unconventional hanging method, I wanted to make sure everything worked properly (aka the frames stayed on the wall and didn’t end up on a cat’s head) before sharing with you. Good news – everything is still intact – heads included! So, first we thought we’d try the paper template method I’d seen Young House Love so wonderfully used recently. 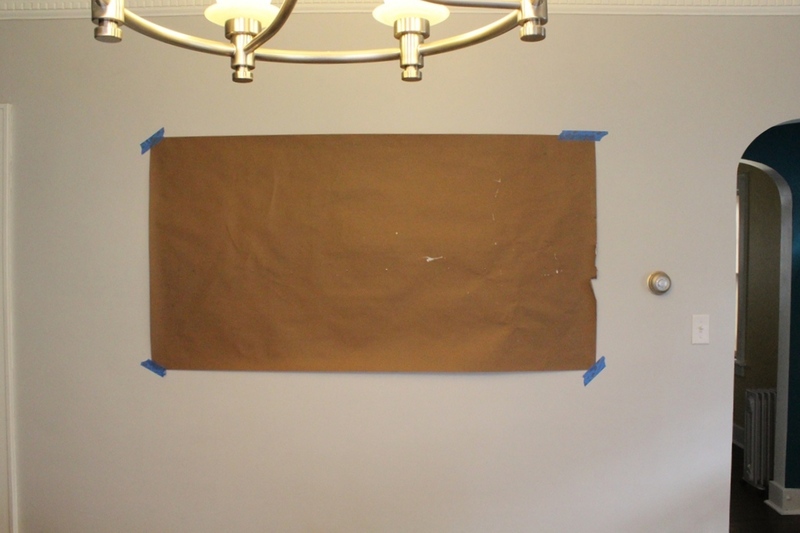 After we laid out the frames exactly how we wanted them on top of a spread out roll of kraft paper (it’s really the painter’s paper they sell at Lowe’s, but don’t tell), Mr. Lemon traced them and then painstakingly measured each individual frame’s hanger – all 20 of them – and marked it on the paper. Because when you buy $8 frames the hangers just aren’t going to be hung with that much consistency, let’s be honest. and Mr. Lemon hammered in all of the nails. When we tried to hang the very first frame and it was crooked – veeery crooked. And I knew this method was doomed for a project that relied on a well spaced grid layout. Plaster walls do not function well with minor nail adjustments! And at that moment, a light bulb went off above my head – VELCRO! – I stuck four sets of velcro squares to the back of each frame – one in each top corner, two on the top and two down either side a bit. Once I had the piece stuck, I would velcro it’s partner on top of it (so there was a sticky side out). 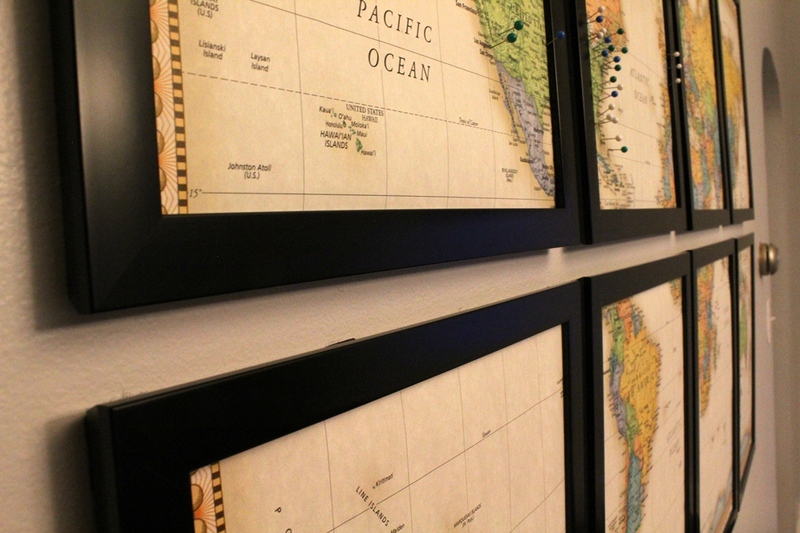 – Thankfully, the paper template process had not been in vain because it helped us to gauge where each frame should be hung. But, we also cut 1″ spacers from an extra piece of foam core lying around . These were stuck between the already-hung-frame and the in-process-of-hanging frame to keep the distance between all of the frames consistent. 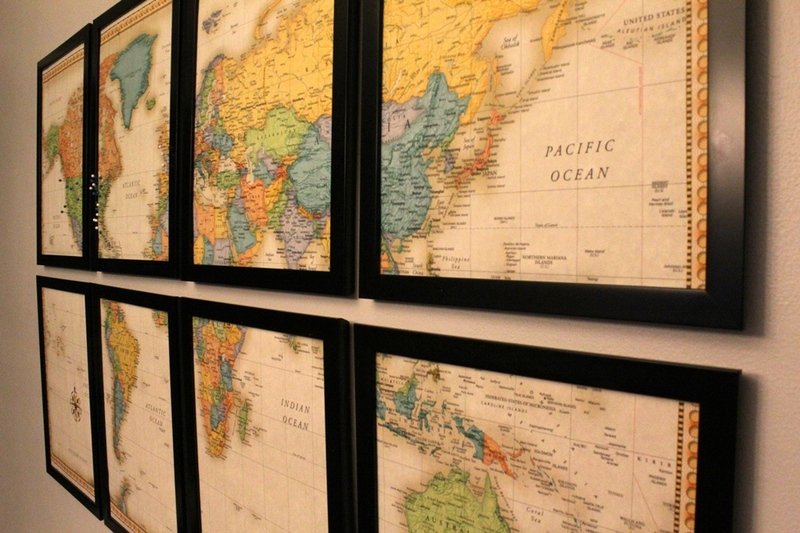 – I would place the frame in the general location (being careful not to let the top/velcro touch the wall yet) it should be hung. Mr. Lemon would slide the spacers in between the hung frame and the new frame so I knew how close to get (the spacers were thick enough to stay put between the two frames when wedged in). Then he would grab the level to make sure it wasn’t crooked. After that I carefully smashed pressed the frame and velcros against the wall. Repeat x8! Only one frame has come apart from the wall at all (and only like two of the velcro squares so it didn’t fall or anything) and I just pressed it back on and it has seemed fine since then. Of course I later heard about the Command Strips meant for this very purpose, but this method is working well for us! The great thing about the velcro is that it is very easy to make slight adjustments, whereas moving a nail 1/8″ in a plaster wall just isn’t going to end well! For around $100, I think it fills up the wall quite nicely! So glad to finally have this on the wall! 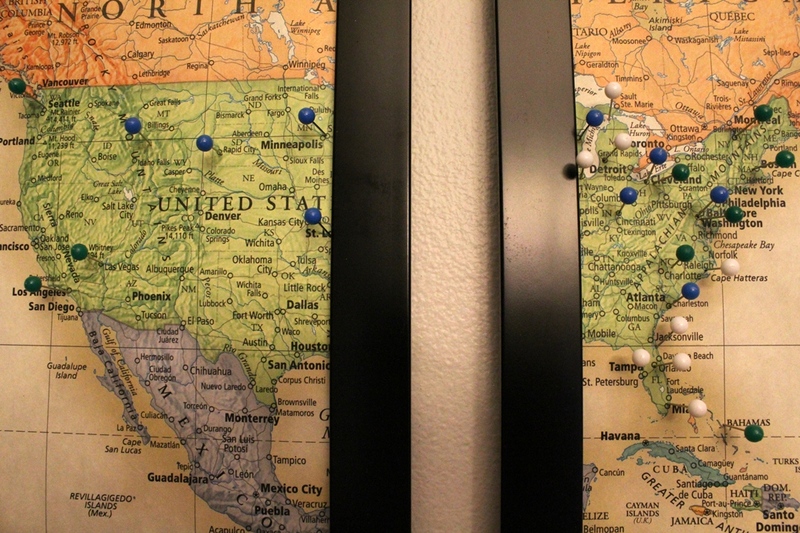 ps – the white pins are where we’ve traveled together, the blue are where I’ve traveled alone, and the green are where Mr. Lemon has traveled alone. Definitely looking forward to adding more white pins in the coming years! This entry was posted in Home Decor, Travel. Bookmark the permalink. I LOVE THIS! I have a map with pins in it of the places I have been too, but this makes it look so much more sleek. Thanks for the idea!